Background: Type 2 diabetes (T2D) is one of the major multi-factorial disorders resulting in various health problems. Despite enormous data generated through GWAS, complete T2D heritability is yet to be achieved. Most of the GWAS platforms are also underrepresented in regulatory genes and nonsynonymous SNPs (nsSNPs) and these may therefore remain undetected. 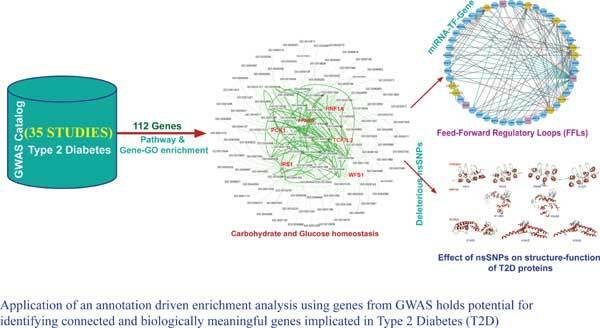 Objective: The present study is an attempt to delineate additional key players of T2D employing systems biology approach on available GWAS results. Method: Genes belonging to significant biological processes (BP) were identified as key genes. Key genes were then used for building gene set enrichment of T2D associated genes using gene-gene and protein-protein networks. The key genes and their connected genes were further used to explore networks involving miRNAs and Transcription Factors (TF), for this, computational feed-forward loops (FFLs) were used. Thereafter, connected genes were also looked for non-synonymous SNPs (nsSNPs) and their effect on structure-function of proteins as elucidated by in-silico analysis. Results: Carbohydrate and Glucose homeostasis (p=1.33E-05) were the significant BP identified which involves HNF1A, PCK1, IRS1, WFS1, PARG and TCF7L2 genes. Computational feed-forward loops showed involvement of regulatory genes such as hsa-miR17, hsa-miR141 (miRNAs) and CTCF (TF) in T2D. Two nsSNPs in the associated genes, PCK1 (I267V) and PEPD (R388H) were found as deleterious and damaging to protein structure. Conclusion: The present study provides new approach towards underpinning plausible genetic heritability to T2D. Experimental validation of these regulatory genes and nsSNPs may provide added insights into pathophysiology of T2D, and holds promise for personalized medication toT2D. Keywords: Diabetes mellitus type 2, genome wide association studies, systems biology, transcription factor, MicroRNAs, single nucleotide polymorphism. Keywords:Diabetes mellitus type 2, genome wide association studies, systems biology, transcription factor, MicroRNAs, single nucleotide polymorphism. Abstract:Background: Type 2 diabetes (T2D) is one of the major multi-factorial disorders resulting in various health problems. Despite enormous data generated through GWAS, complete T2D heritability is yet to be achieved. Most of the GWAS platforms are also underrepresented in regulatory genes and nonsynonymous SNPs (nsSNPs) and these may therefore remain undetected.